Chemical physics is an area of modern chemistry that will fascinate students who enjoy the science common to physics and chemistry. You will gain a fundamental understanding of the origins of chemical behaviour, while exploring exciting developments at the interface of chemistry with the other physical sciences. Chemical Physics is offered either as a three-year BSc programme or as a four-year MSci. Modules are identical for the first two years of study, so you can defer which to opt for until the end of your second year. We advise you, however, to select the four-year MSci programme initially as this gives you the most control over your plans. 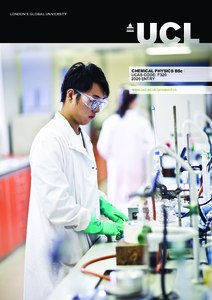 Although the Chemical Physics BSc is based on core chemistry modules, there is more scope to develop skills in physics and theoretical aspects of chemistry, and either inorganic chemistry or organic chemistry is omitted after the first year in favour of mathematics, physics and specialist chemical physics modules. In year one all modules are compulsory, and in year two you will take a combination of compulsory modules together with a number of optional Chemistry modules and further optional modules from outside the department. In the third year you take further compulsory and optional modules including a literature project and extended laboratory classes. You will also select a further 0.5 credits of Mathematics, Physics or Chemistry options and 0.5 credits from all approved undergraduate options. Detailed course descriptions are available on the department website: Chemical Physics BSc.